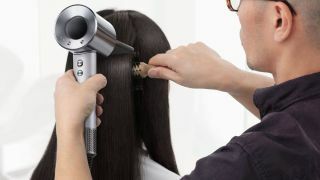 Dyson, a company mostly known for vacuums, has engineered a high-tech hair dryer called the Dyson Supersonic. The Dyson hairdryer features innovative technology that puts it in a category of its own and is unlike any traditional hair dryer. The Supersonic features a digital motor that creates ultra-fast drying while also preventing heat damage. The only downside of this futuristic hair dryer? The Supersonic is priced well above most hair dryers, currently retailing for $400 in the US and £300 in the UK. But fear not, we're here to ease your financial pain by listing the best prices and sales below so you can get the best deal on the premium hair dryer. The Dyson Supersonic hair dryer is built with a powerful V9 digital motor that combined with air multiplier technology produces high-velocity controlled air for fast, controlled drying. The Supersonic hair dryer measures air temperature 20 times a second so you'll never have to worry about damaging your hair with extreme heat. The Dyson hair dryer offers four different heat settings as well as three different speed settings so you can style your hair exactly how you want. The controlled heat and settings also help with reducing frizz so you can achieve sleek, smooth hair with every use. The Supersonic also comes with three different magnetic attachments so you can achieve different styles using just one tool. See the best prices and sales available for the Dyson hair dryer below. If you're still undecided about the Dyson hair dryer we've answered some common questions below to help with your buying decision. Dyson hair dryer price: is the Dyson hair dryer worth the money? The high price tag on the Dyson hair dryer can initially cause sticker shock, but there are several reasons for the steep price. The Supersonic is engineered like other Dyson appliances and therefore priced similarly. The Dyson hairdryer features a tiny a digital motor that combined with the heat sensor produces fast drying results without damaging the hair. Dyson installed the tiny motor in the handle rather than the head which balances the weight of the dryer so your hand won't get tired when drying your hair. The Supersonic will also outlast other hairdryers so you won't have to keep repurchasing the same $70 hair dryer every couple of years. Does the Dyson hair dryer dry faster? The short answer is yes; the Dyson Supersonic dries hair faster and more efficiently than traditional hair dryers. The Dyson hair dryer combines controlled heat with a powerful motor that results in drying time that's twice as fast as most hair dryers. The Supersonic also features three different drying speeds so you can control how fast you want your hair dried. Learn more about the Dyson hair dryer with our Dyson Supersonic review. You can also shop for more Dyson discounts with our best cheap Dyson deals and offers that are currently going on.